During the Vancouver 2010 Olympics, Tourism BC launched a new app: Near Me BC. I profiled the app at the time, but other than frequent visits to Whistler and a weekend in Vernon at Sparkling Hill Resort, I haven't needed to use the app much until this past weekend. Prior to lounging in Kelowna for the long weekend, my husband and I spent Friday doing something that's been on our travel to do list for a long time: wine touring in BC! After Ontario, BC is Canada's second largest wine region, so we're attempting to chip away at wineries slowly---similar to how you'd drink an aged red:) With this in mind, we chose to start in the Naramata Bench near Penticton. Description: Use this app to plan your wine tour by selecting the area > attractions for a list of wineries. 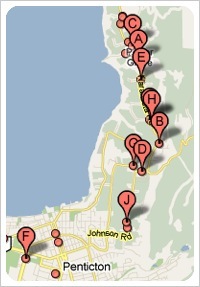 Description: Find wineries in the region you want to tour, view hours, make notes, mark favourites and more. Description: The maven of wine has an app for that. Search by country and area to view wineries, pairings, reviews and more. Description: Here's a tip on how to use Google maps for wine touring: Enter in your location, then enter "wineries" and the map will show wineries in the region you initially searched.